It takes a lot to surprise followers of MB&F, but the latest version of Horological Machine No2, with a case created by French artist watch designer Alain Silberstein, may well do it. Alain Silberstein is widely known for his bold use of colour and pattern – and one might have expected the adventurous Maximilian Büsser to push that tendency to the limit. But no, the two have come up with what they affectionately call the “black box”, all Bauhaus purity and restraint. It is crafted like a jewel, but Silberstein says that it reminds him of the miniature box cameras of the 1940s. MB&F (which stands for Maximilian Büsser and Friends) is a company dedicated solely to designing and crafting small series of radical concept watches in collaboration with talented professionals. The Büsser/Silberstein model is based on Horological Machine No2, introduced in 2008, and featuring the world’s first mechanical movement combining an instantaneous jumping hour, concentric retrograde minutes, retrograde date, bi-hemisphere moon phase and automatic winding. The original case, crafted by MB&F, is the most complex in watchmaking history. But its inventors like to keep the creative juices flowing. Alain Silberstein is the second Friend invited to come up with a case, and his concept will be produced as a limited series of just EIGHT watches, engraved with the name Horological Machine No2.2. The first Friend was the American artist, Sage Vaughn, whose model was created for Only Watch, the charity auction held this year to benefit research into Duchenne Muscular Dystrophy. In terms of design, the Silberstein case retains the twin porthole dials and powerful profile of the original Horological Machine No2 with its flying-buttress lugs. But otherwise, it has been entirely rethought and rebuilt. The science-fiction shock of the original has given way to something lighter and more whimsical, with a personality all its own. He conceived the rectangular case as a solid block of titanium, resting on the original steel substructure of Horological Machine No2. This multi-layered construction is what gives the watch its powerful, richly engineered profile. But face-up, the case is simple. The titanium is treated with an exclusive PVD coating incorporating silicium. The result is a peculiarly intense black, together with a soft touch and resistance to finger marks. Silberstein placed great importance on the tactile qualities of the case, saying that you must touch an object to understand it. As regards the shape of the case, he likens his approach to that of a diamond cutter, working on the play of mat and polished surfaces, depending upon how the case catches the light. Since the structure is elegant in itself, very little embellishment was needed. Two stripes of red enamel inlaid into the sides of the case add a precious note and echo the colour of the markings on the twin dials. For the first time in a Horological Machine, the jumping hours, on the right-hand dial, are presented in an aperture, which is framed by the concentric retrograde minutes. The left-hand dial presents the retrograde date and the moon phase. The dials are remarkable for their vivid personality, explained by the fact that, like the graphic artists of the 1920s and 1930s, Alain Silberstein designs every dot and dash himself. “They are the face of the watch”, he says, “and I spend an enormous amount of time thinking about their scale and shape.” All the red characters are in Superluminova, to be legible in the dark. In the best Bauhaus tradition, this watch is easy to read. But its designer is French, and he likes his Bauhaus with a touch of whimsy. The moon in its aperture recalls the moon in the iconic “Little Nemo” cartoons produced in America during the Art Nouveau period. Alain Silberstein finds its expression “sympathique” and has been designing moons around it for the past 23 years. Alain Silberstein is French and his workshop is in Besancon. He trained as an interior architect and designer, but quickly turned his talents to high-end watch design. His masterly handling of geometry and colour translates into collections that sparkle with inventiveness and wit. Maximilian Büsser first spotted his work 20 years ago, when overtaking a BMW Z1, whose doors were down revealing the driver’s giant black chronograph. The look and size of that chronograph – years ahead of its time – decided MB&F’s future founder to keep a close eye on its creator, and he has done so ever since. According to Maximilian Büsser: “Every year, Alain Silberstein’s collections surprise me. He is a true artist, but he never takes himself too seriously. 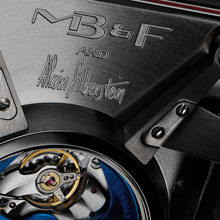 He has kept that childlike spirit, and that is something that we at MB&F hold dear”. 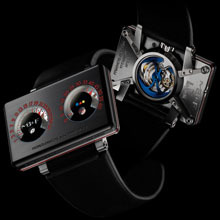 A little over four years ago, Maximilian Büsser left what was considered a dream job, as head of Harry Winston Timepieces, in order to set up MB&F, a company dedicated solely to designing and crafting small series of radical concept watches in collaboration with talented professionals. Or, as he says: “To letting my guts speak instead of my head” – a spirit shared by all the independent craftsmen, engineers and watchmakers who collaborate on his projects. Maximilian is half Swiss and half Indian and believes that this explains his constant drive to combine flawless traditional quality with creative imagination run wild. Horological Machines Nos. 1, 2 and 3 are the fine results to date. The new watch is a unique interpretation of Horological Machine No2, which was launched as a limited series in 2008. HM2 typifies the radical approach to high-end horology taken by Maximilian Büsser and his Friends. It is a high-tech time machine of the twenty-first century and an incredibly sophisticated micromechanical work of art. It houses the world’s first mechanical movement – “engine” in MB&F language – to offer an instantaneous jumping hour, concentric retrograde minutes, retrograde date hand, a bi-hemisphere moon phase and automatic winding. Internally, Horological Machine No2.2 is both a “black box”, and the product of childhood dreams. The 22-karat gold automatic rotor, with its deep blue tint, has the jewel-like hand-finish reserved for the elite of traditional watch movements, but it owes its iconic sickle shape to the double-headed battleaxe wielded by Maximilian Büsser’s childhood comic hero, Grendizer. 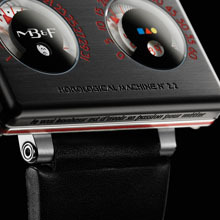 All the great sci-fi TV series – Star Trek, Thunderbird, Dr Who and Star Wars – have played a role in MB&F’s creations. It is the tension between fascination with that imaginary world and a love of high-end horology at its purest that gives the machines their vitality. Sapphire crystals: Dial side with anti-reflective treatment on both faces. Display back with anti-reflective treatment on single face.